The Crum Regatta, an annual college tradition, was removed from the schedule for the school’s parent and alumni “Garnet” Weekend for the indefinite future. In addition, Registrar Martin Warner said he will be stepping down from his role as “Commodore” of the regatta after twenty years serving in the position. The event has been postponed until the spring and will no longer be run by the school’s alumni office. It is also unclear whether there will still be cash prizes. Responsibility for the regatta was shifted to Swarthmore’s Office of Student Engagement, but it’s unclear who exactly is in charge. The decision to remove the event from the Garnet Weekend schedule this year went largely unannounced, according to engineering major Kira Emmons ’20. After she realized that Garnet Weekend was coming up and she hadn’t received an email from the alumni office, Emmons asked Warner about the status of the event. According to Emmons, he informed her that he did not know why the event was removed from Garnet Weekend. Associate Director of Events Geoff Semenuk, who helped run the event in years past, mentioned decreasing participation in the event recently. Semenuk sees the future of the event in the spring, as student-run and potentially nature focused event. “Hopefully … the students will take ownership of the regatta and make it more of a break from studying, a celebration of nature, or maybe an Earth Day event,” said Semenuk. Director of Student Activities Andrew Barclay also mentioned that the event may have an environmental component in the future. According to Warner, the event has probably been going on since the early 1970s, but it’s unclear exactly when it started. The event involves small groups of students racing on the Crum using homemade boats or rafts constructed for the event. Usually, the boats are made out of repurposed objects like balloons, garbage bags, or water bottles, said Warner. Some students even engineer boats out of wood or metal on campus for the event. Rhys Manley ’20, a physics major, helped to construct a seven-foot plywood rowboat his first year and a ten-foot aluminum canoe his second year. Teams also dress up in themed costumes for the event, and there are various prizes awarded to participants such as The Crum Crik Cruiser Award for the best-engineered boat. The prizes cover categories such as first to cross the finish line, most innovative use of materials, best costumes, and regatta spirit, said Warner. The top prizes usually pay about $50-$100 and the prizes are critical for covering the cost of a boat, said Emmons, which was generally about $100 for her team. Emmons mentioned that cash prizes may no longer be offered now that the regatta is student-run. The event fits with the quirky side of Swarthmore, similar to events such as the Pterodactyl Hunt and Ninja Grams, said Warner. Emmons echoed this sentiment, calling it the type of event the school likes to advertise on social media. She also mentioned that she values how the event serves to bridge the gap between liberal arts and natural sciences majors. The event also serves as a chance for alumni to interact with current students. Whether or not the event happened on Garnet Weekend wasn’t an issue, said Manley, however he was interested in making sure the event wasn’t canceled for good. The shift in responsibility from the alumni office to OSE sparked concerns that the event may not happen at all, he said. 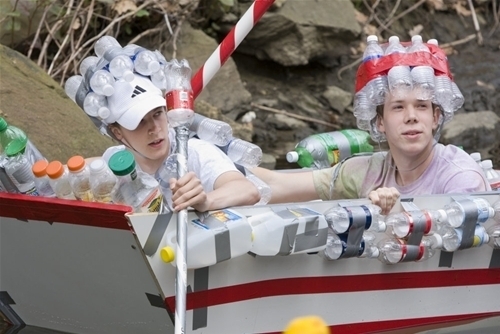 The Regatta is a time-honored Swarthmore tradition, though whether or not it will continue to be has not yet been determined. The decision to hold the regatta will likely be up to both students and OSE.